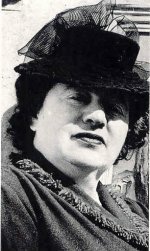 Irma Stern was born in 1894 in the small South African town of Schwiezer-Reneke and died in Cape Town on 23 August 1966. At the outbreak of the South African War her parents moved back to Germany where she lived until 1920. In 1913 Stern studied art in Germany at the Weimar Academy, in 1914 at the Levin-Funcke Studio and notably from 1917 with Max Pechstein, a founder of the Novembergruppe. Stern was associated with the German Expressionist painters of this period. She held her first exhibition in Berlin in 1919, the first of nearly one hundred solo exhibitions she was to hold in her lifetime. However, her first South African exhibition in Cape Town in 1922 she provoked controversy because of her modern art style. She returned to Germany, but decided to live in Cape Town in 1926. Stern was to travel extensively in her lifetime: in 1930 to Madeira, in 1937 and 1938 to Dakar, Senegal, 1939 Zanzibar, 1942 Congo, 1945 Zanzibar, 1946 Central Africa, 1952 Madeira, 1955 Congo, 1960 Spain and 1963 France. Stern travelled extensively in South Africa, for example in 1926 to Swaziland and Pondoland, in 1933 to Namaqaland, in 1936 generally, and in 1941 to the Eastern Cape. Stern compiled travelogues of the Congo in 1943 and of Zanzibar in 1948. Stern painted the landscape and people she encountered on her travels in a vivid and vibrant style. Stern's sumptuous and exuberant still life paintings where painted in her home studio using flowers from her garden and object she had collected. Stern used a wide range of mediums including charcoal, pen, pencil, felt pen, oil pastel but her preferred medium was oil paint which she applied with a brush or knife. Stern's idealization of her African subjects and her sensuous use of colour shaped her reputation. Stern's contribution to South African art was considerable and as a consequence a major retrospective exhibition of her work was put together in 1968. In 1971 the Irma Stern Museum was opened in her home, The Firs in Rosebank, as part of the University of Cape Town's collection. In addition, her work can be seen at the Africana Museum, Ann Bryant Art Gallery, Durban Art Gallery, Johannesburg Art Gallery, Kind George VI Art Gallery, Pretoria Art Museum, Tatham Art Gallery and William Humphreys Art Gallery.